"We bring our own food, water, bedding, office supplies, solar panels and even mosquito nets," said Red Cross volunteer Winnie Romeril, pictured here at a refugee camp in Port-au-Prince. "We don't send the newbies to something like this." Port-au-Prince, Haiti (CNN) -- They have come from all over the world, speaking a multitude of languages and representing dozens of countries. Diverse as the planet itself, they are all united by one mission: to save lives. The number of relief workers in Haiti is now in the thousands and is expected to increase as Haiti continues to recover from the devastating January 12 earthquake. Relief workers have pulled survivors from the rubble, given them food and water, set up water purification plants and opened shelters. They are also helping doctors and nurses by distributing medical supplies and equipment. The local government collapsed after the earthquake, so international aid groups took the lead in responding to the massive need. But when it comes to meeting their own needs, who helps the ones who are here to help others? International relief organizations such as the Red Cross realize they have to be self-sufficient. Communication networks, roads and services in Haiti are in such bad shape that it would be challenging to acquire provisions. "We bring our own food, water, bedding, office supplies, solar panels and even mosquito nets," said Winnie Romeril, an international disaster response volunteer with the Red Cross. "A lot of it comes down to preparation and experience. We don't send the newbies to something like this." The Red Cross set up a tent village right outside the Toussaint Louverture International Airport in Port-au-Prince with a dual purpose. It serves as living quarters for staff and volunteers as well as a distribution center. Some 400 international Red Cross staff and volunteers are supporting the 2,000 local personnel. 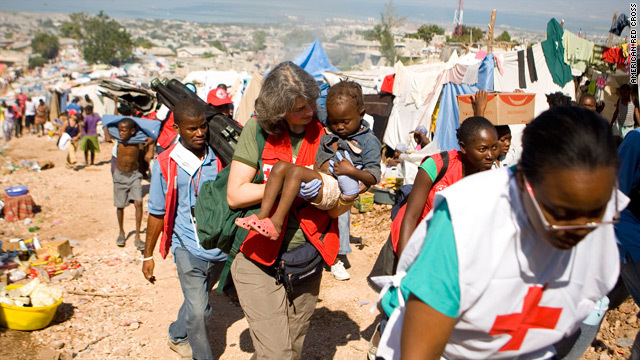 Carol Shattuck, chief of staff for AmeriCares, was part of the aid group's four-member emergency response team in Haiti. They arrived the Sunday after the earthquake, spending the night at the airport in a tent because there was no other option. "The advance team actually just stayed at the airport on the cement," said Shattuck. "Somebody found them sleeping bags." The next morning, they began delivering aid to AmeriCares' health care partners in Port-au-Prince. Later, they stayed at one of the few hotels that was still open in Port-au-Prince. Shattuck said the team members survived on energy bars and bottled water they carried in their backpacks as they worked 12 to 16 hours each day. When it came to clothing, they also faced some complications. "We haven't done any laundry yet," Shattuck said, several days after arriving. "There are a few items that I wish I would've brought more of, like socks, and I wish I had a second pair of shoes." My clothes aren't washed, but I have baby wipes. We have a shower, but water is not always available. But don't think for a moment that relief workers are asking for compassion. In fact, many gladly embrace the challenge. Some volunteers, like Romeril, abruptly left behind their jobs and families to answer the call to help. She's a flight paramedic who works with a helicopter team in upstate New York. For this mission, she asked her boss for two weeks off, but her stay in Haiti may be longer. "My clothes aren't washed, but I have baby wipes," Romeril said. "We have a shower, but water is not always available." After the earthquake, Torree Nelson of Habitat for Humanity International wasn't able to get in touch with his local workers for two days. He had no way of knowing if there had been any casualties among his group. Luckily, they were all accounted for and quickly resumed their jobs helping people. "I think the nature of what is being done here requires that sort of commitment," Nelson said. His organization manages a year-round housing program in Haiti with a staff of 40 people. More than the daily needs of relief workers, Nelson is concerned about the future of Haiti. What's going to happen once the journalists leave and the tragedy begins to fade from people's memory? Already the poorest country in the Western Hemisphere before the earthquake, Haiti faces unimaginable challenges including infrastructure, public services and, most importantly, housing. "We need to have staff for five to 10 years doing this work," Nelson said. "And so we need to have staff that is committed, but we also need a support structure, and we need the public and others -- donors and institutions that we work with -- to recognize and stay committed for the long term and find ways for us to make that sustainable."